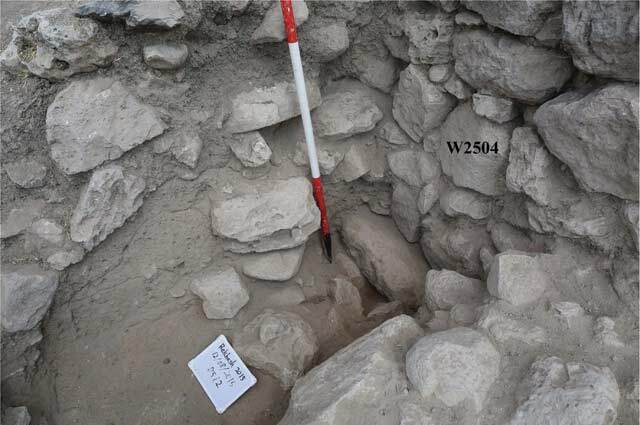 In August 2015, the ninth season of excavations was conducted at Tel Rekhesh (License No. G-66/2015; map ref. 243776/728600). The excavation, undertaken on behalf of Tenri and Rikkyo Universities (Tokyo, Japan) and underwritten by Grant-in-Aid for Scientific Research of the Japan Society for the Promotion of Science (KAKENHI; A—Subject No. 25257008; B—Subject No. 25300022; No. 15H05165), was directed by H. Kuwabara (Tenri University), S. Hasegawa (Rikkyo University) and Y. Paz (IAA). The expedition included T. Onozuka, H. Hashimoto, H. Hino, Y. Tatsumi and M. Aviam (area supervision), T. Kishida (GPR surveying), N. Yamauchi, H. Tsumoto, H. Odagi, R. Yamaguchi and C. Yasui (surveying and photography), H. Nakano (photography), S. Miyazaki (registration) and Z. Gal (administration). The excavation concentrated on the higher mound of Tel Rekhesh, within areas that were opened in earlier seasons (Fig. 1), and focused on the Iron Age IIC architectural complex, apparently an administrative complex, and on the Early Roman-period settlement. In the southeastern part of the mound’s crest (Area F), the excavation aimed at exposing additional segments of the southern enclosing wall of the Iron Age building complex. 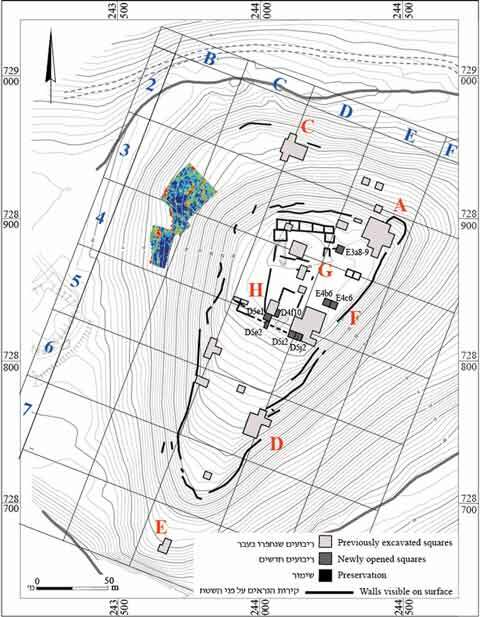 This building was assumed to have occupied a large part of the higher mound, and indeed what may be the northeastern corner of the complex was unearthed after it was detected in a GPR survey. In the southern part of the higher mound (Area H), half a square was opened to further expose the plastered stepped element that was partially excavated in 2014 (Hasegawa, Kuwabara and Paz 2017). Along the northern edge of the higher mound (Area G), a new square was opened to probe the Roman-period architecture, which may have belonged to the Jewish settlement. In addition, a GPR survey was conducted along the lower western ‘shelf’. 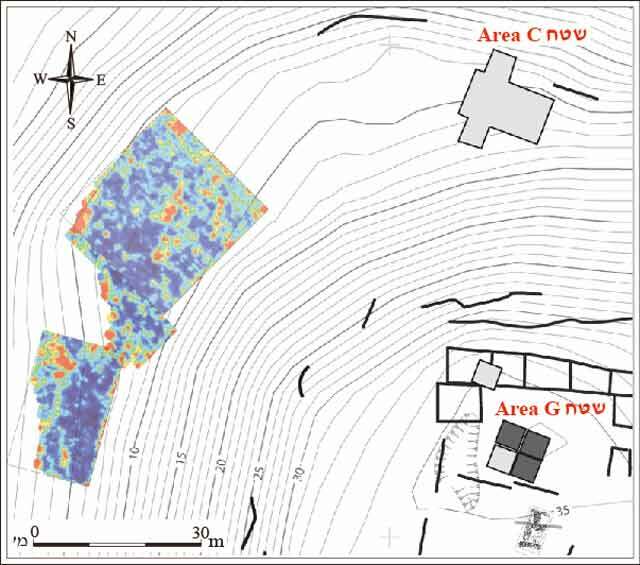 This survey aimed at identifying architectural remains of the Late Bronze – Iron Age I settlement, when the settlement at Tel Rekhesh reached its apex. The Southern Wall (Area F; Sqs D5i2, D5j2). We continued to expose the southern enclosing wall (W2504, W2506; width c. 1 m; Figs. 2–4) in two new squares (D5i2, D5j2). 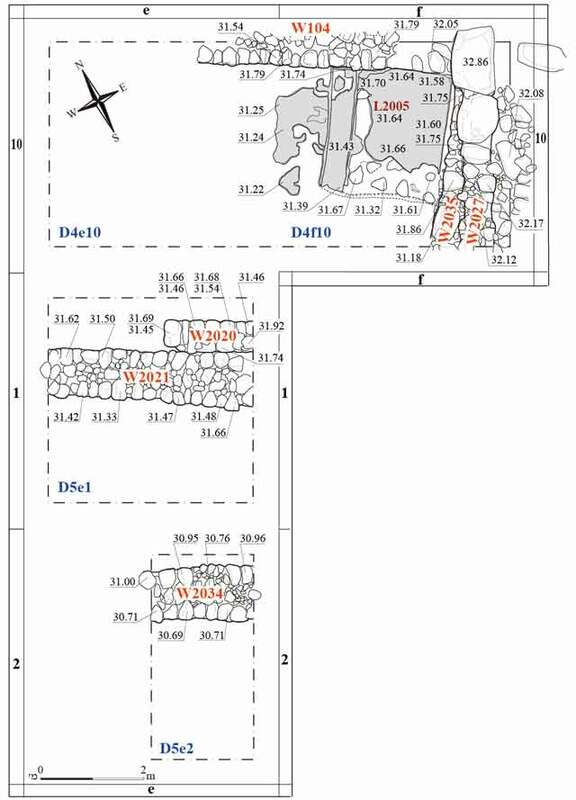 The wall had already been exposed during the 2008–2014 seasons in a sounding on the southeastern side of the complex (Hasegawa and Paz 2015), where a monumental stone paving of the entrance to the casemate rooms was unearthed (Tsukimoto et al. 2011). It seems that the exposed wall segments were constructed on a stone bedding that leveled the uneven bedrock, as evident in a narrow sounding at the southwestern corner of Sq D5i2 (Fig. 5). Debris containing collapsed stones from the wall was piled along the southern edges of both squares (Fig. 4). The debris yielded pottery of the seventh–sixth centuries BCE. Three transverse walls were uncovered in the northern part of the two squares (W2508—width 0.7 m; W2515—unknown width; W2516—width 0.7 m). These walls enclosed three rooms within the administrative complex: the western room (L2523; length 1.6 m) had a stone-paved floor at 30.38 m asl; the middle room (L2519; 2.5 × 3.5 m) had a packed-earth floor situated c. 0.1 m higher than that of Room 2523; and the square, eastern room (L2518; 3.5 × 3.5 m), which was partially excavated in 2013 (Hasegawa and Paz 2015), has a floor 7 cm higher than the one to its west. The fill from topsoil down to the floors of these three rooms (thickness 0.5–0.8 m) contained large amounts of Early Roman-period pottery. The building was probably intentionally filled-in, to level the surface during this period. The rest of the pottery consisted of Iron Age IIC types (seventh–sixth centuries BCE). The Northeastern Corner(?) (Area F; Sqs E4b6, E4c6). A GPR survey detected a corner of massive walls in the northeast part of the area (Fig. 6). With the anticipation that this may be the northeastern corner of the Iron Age administrative complex, two squares were opened (E4b6, E4c6; Figs. 7, 8). The most extensive architectural element found was a wide wall (W2705, W2709; width c. 1 m) that ran across the two squares in an east–west direction. Segment 2705 ended with a large fieldstone, right by the eastern edge of the higher mound, adjoining no other wall; hence, we assume that W2705 served as an extended pier that protruded out of the eastern enclosing wall of the complex. This suggestion may be supported by another finding: a large, round basalt object (diam. 0.2–0.4 m, depth 0.2 m), possibly a column base or a door socket, located north of W2705, apparently in an open area in front of the complex. The in situ pottery, which was found in the soil around this basalt object (L2710), contained large Iron Age IIC pottery sherds; most notable among them were fragments of a large flask. The northeastern corner of the complex may have been formed by the joining of W2709 and two adjacent narrow walls (W2714, W2715). This would explain the misalignment of the walls discerned in the GPR survey results (Fig. 6). It can be clearly seen that the eastern enclosing wall of the complex (W982; width 1 m), which was excavated in 2014 (Hasegawa, Kuwabara and Paz 2017), had a slightly different orientation than that of Walls 2714 and 2715, raising the possibility that these walls belonged to different structures. On the other hand, the proximity of Walls 2714 and 2715 to W982 seems to suggest that they nevertheless relate to each other. Thus, the results of the 2015 excavation do not allow us to establish with certainty the location of the northeastern corner of the administrative complex. Nonetheless, the absence of any Roman-period remains in Sqs E4b6 and E4c6 has enabled us to excavate loci of uncontaminated contexts, where large amounts of Iron Age IIC pottery were retrieved for the first time. These included storage jars, mainly of the ‘torpedo’ type, cooking vessels, mortaria, and a few ‘basket handles’—all dated to the seventh–sixth centuries BCE. The Plastered Stepped Element (Area H; Sqs D4f10, D5e1, D5e2). The plastered stepped element (L2005; Figs. 9, 10; Hasegawa, Kuwabara and Paz 2017) was further exposed when the excavation was extended eastward (Sq D4e10). Only two of the element’s enclosing walls have been unearthed: W2035 on the east, built of a single row of limestones and basalt fieldstones, and W104 on the north. No walls have been found to date to the south and west. A thin layer of plaster found on the western face of W2035 suggests that the plaster originally covered the entire wall. This wall was superimposed by a north–south wall (W2027; Fig. 11), which belonged to a Roman-period structure; it includes a large threshold stone (0.6 × 0.8 m), which was positioned directly on top of W2035. The pottery retrieved from this area dates from both the Iron Age IIC and the Early Roman period. (A) The stepped element was constructed and plastered in the Iron Age IIC, as a part of a ceremonial bathroom or pool, facing Mt. Tabor. After the building went out of use, soil covered and protected the plaster from decaying. During the Roman period, a new structure was built east of the room, partly destroying its eastern edge, and the bath/pool was used as a refuse pit, into which pottery sherds were thrown by the dwellers of the Jewish village. (B) The stepped element was constructed and plastered during the Iron Age IIC and was re-used in the Early Roman period for an unknown purpose. (C) The stepped element was constructed as a ritual bath (miqveh) during the Early Roman period, at which point W104, originally of the Iron Age IIC, was reused as its northern wall; both the ritual bath and W104 were then covered with the hydraulic plaster. This may be evinced by W2027, which dates from the Roman period but roughly follows the course of Iron Age W2035. This possibility, however, seems less plausible than the others, since no Roman pottery was found within the steps’ construction core, whereas Iron Age IIC sherds were found, and the elevation of the upper step fits other Iron Age IIC floors in the building complex. It is also clear that W2027 was built differently from W2035 (Fig. 11) and was abutted with loose brown soil, whereas W2035 was abutted with gray ‘mound’ soil, from which Iron Age pottery was retrieved. Finally, it is uncommon for a miqveh to be constructed on top of an earlier structure (Jewish religious law requires a miqveh to be, at least partly, hewn in the rock; e.g., Reich 1997). The Southern Wall (Area H; Sqs D5e1, D5e2; Fig. 9). 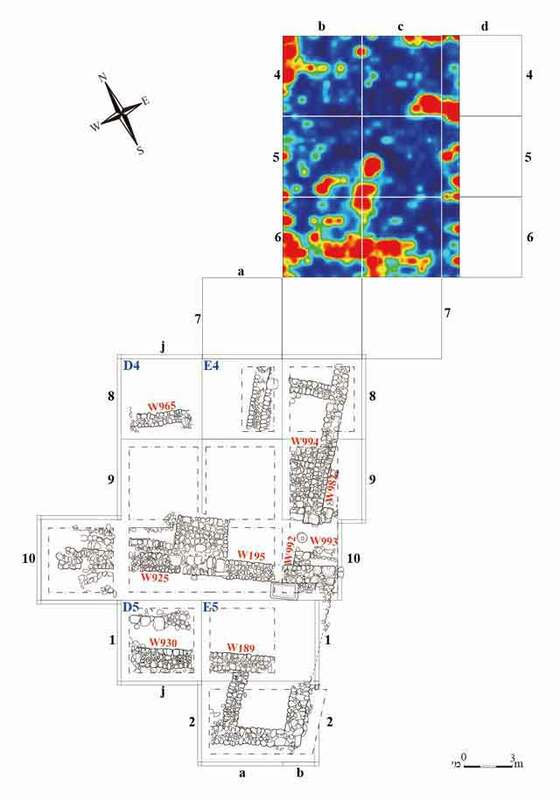 Two squares were opened to the south of the plastered element (D5e1, D5e2) to expose another segment of the southern enclosing wall of the Iron Age complex and assess its relation to the plastered element. The wall (W2034; width c. 1 m; Fig. 12), exposed in a probe in Sq D5e2, was preserved to a height of three courses. A parallel wall (W2021; width 1 m), unearthed in Sq D5e1, enclosed a space (width 3 m) between them. A third wall (W2020; exposed length 1.5 m, width 0.6 m), of which only one course survived, was probably added to W2021 in a later phase of construction within the administrative complex. 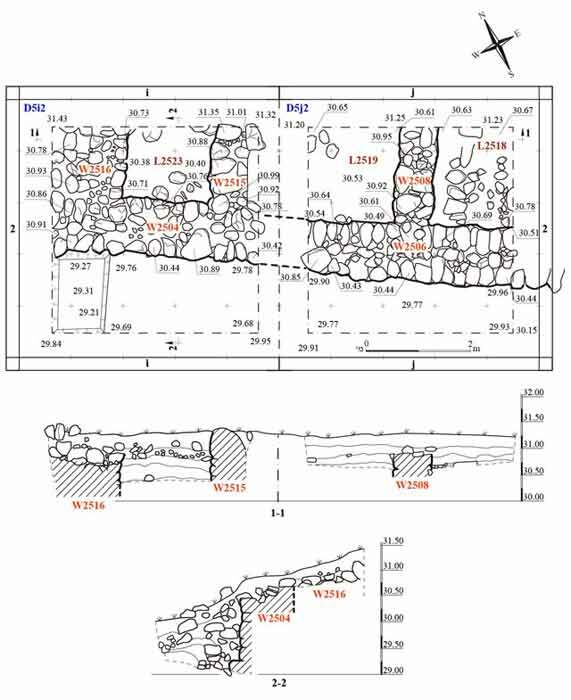 A similar phenomenon—walls added along the inner face of existing walls—was discerned in Area D4 (W925; Tsukimoto et al. 2011: Fig. 7). The pottery from the space between the walls included Early Roman-period sherds from the Jewish settlement and Iron Age IIC sherds from the administrative complex. A 5 × 5 m excavation square (Sqs E3a8, E3a9; Figs. 13, 14) was opened c. 20 m east of the public building excavated in the previous three seasons (Tsukimoto et al. 2013) to better understand the nature and extent of the Jewish settlement on the northern side of the mound’s crest. It yielded segments of two parallel, east–west stone walls (W1043, W1044). 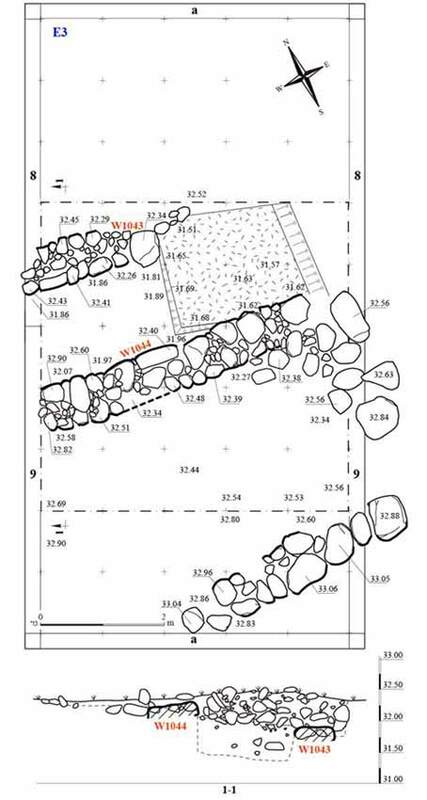 Wall 1044 (exposed length 2.2 m) was constructed on a thin layer of fill (c. 0.1 m) situated directly on that bedrock, which was artificially flattened at this point. Its eastern end was probably cut by quarrying activities in the Roman Period, as demonstrated by the mixed pottery—Roman and earlier—found on the bedrock, suggesting that the wall was constructed prior to quarrying, probably during the Iron Age. Wall 1043 (width 0.6 m), which crossed the entire square, was constructed on the same bedrock level as W1044. Roman-period pottery (first and second centuries CE)—mostly cooking vessels and storage jars—was found in large quantities beside earlier pottery. A large scale GPR survey was conducted on a wide and rather flat ‘shelf’ on the northwestern slope of the tell. 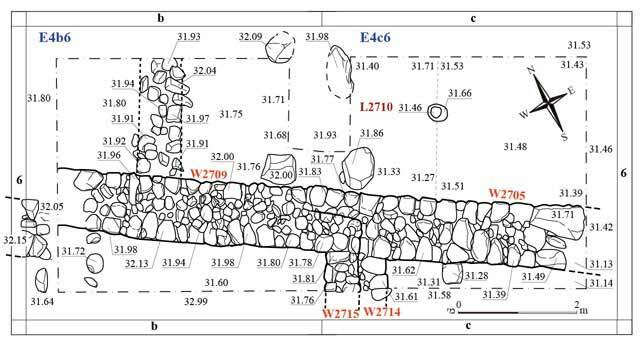 The survey indicated the existence of substantial architecture throughout the surveyed area, including a massive wall that could be a fortification line at the edge of the shelf (Fig. 15). The 2015 season of excavations at Tel Rekhesh extended the exposure of the Iron Age administrative complex. If the corner unearthed in the northeastern part of the complex (Area F) is indeed its outer corner, we can estimate the dimensions of the complex at 35 × 50 m. Furthermore, the undisturbed nature of the excavated squares near the corner provided clean contexts that confirmed our tentative date for the construction and early use of this complex in the Iron Age IIC (seventh–sixth century BCE). The ceremonial parts of the complex include large reception halls. The Roman-period Jewish settlement probably covered the northern part of the mound’s crest, and included at least one public building, as well as other, more modest, structures. Hasegawa S. and Paz Y. 2015. Tel Rekhesh – 2013. HA–ESI 127. Hasegawa S., Kuwabara H. and Paz Y. 2017. Tel Rekhesh – 2014. HA–ESI 129. Tsukimoto A., Kuwabara H., Paz Y. and Hasegawa S. 2011. Tel Rekhesh – 2009. HA–ESI 123. Tsukimoto A., Kuwabara H., Paz Y. and Hasegawa S. 2013. Tel Rekhesh – 2010. HA–ESI 125. 1. Location map of the excavated squares and GPR survey in 2015. 2. Area F, Sqs D5i2 and D5j2, plan and sections. 3. 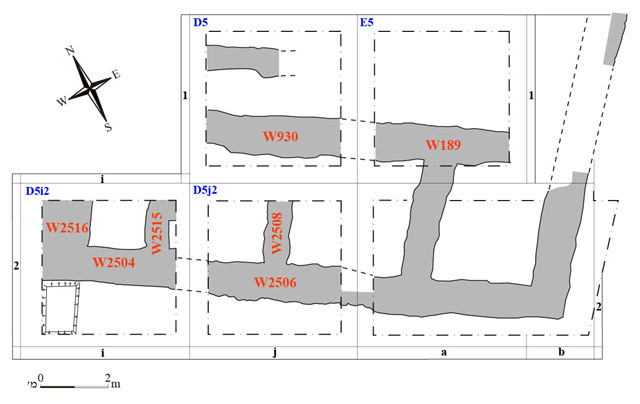 Area F, Sqs D5i2 and D5j2 and previously excavated adjacent squares, schematic plan. 4. Area F, Sqs D5i and D5j2, looking east. 5. Area F, sounding in the southwest corner of Sq D5i2, looking west. 6. Area F, GPR survey results. 7. Area F, Sqs E4b6 and E4c6, plan. 8. Area F, Sqs E4b6 and E4c6, looking east. 9. Area H, Sqs D4f9, D4e10, D5e1 and D5e2, plan. 10. Area H, the plastered stepped element (L2005) and related walls, looking east. 11. Area H, Walls 2027 and 2035 and the plastered stepped element (L2005), looking north. 12. Area H, Sqs D5e1 and D5e2, looking west. 13. Area G, Sqs E3a8 and E3a9, plan and section. 14. Area G, Sqs E3a8 and E3a9, the Early Roman-period structure, looking east. 15. The western slope, GPR survey results.